The 40m maxi sailing trimaran Banque Populaire V has crossed the famous Cape Horn this morning, continuing her race against the time to win the Jules Verne Trophy. 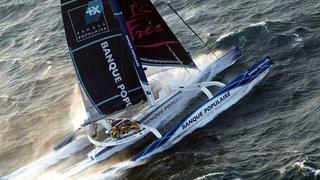 Banque Populaire V only needed 30 days, 22 hours, 18 minutes and 48 seconds to reach Cape Horn since it crossed the start line in Ouessant. This is no less than the fourth world record in less than a month of racing for this maxi trimaran designed by VPLP. The figures are impressive: Banque Populaire V has an average speed of 26.7 knots since the beginning and is still 535 nautical miles ahead of the reference time established by Groupama 3 in March 2010. But the last leg in the Atlantic could be the most difficult part of the race for Banque Populaire V. The maxi trimaran lost great deal of her advantage in the Pacific due to the presence of a lot of icebergs. With only one day of advantage now, Loïck Peyron and his team will need to find the perfect route between anticyclones. Now Banque Populaire V needs to arrive before January 9th, 17 hours, 15 minutes and 34 seconds (Paris time) to win the Trophy.